Now there’s that uncomfortable line between “ironic hipster comedy” and just plain nonsense. With the first two episodes of this fourth season of Comedy Bang! Bang! being a return to the form, it makes sense to assume that streak would continue. 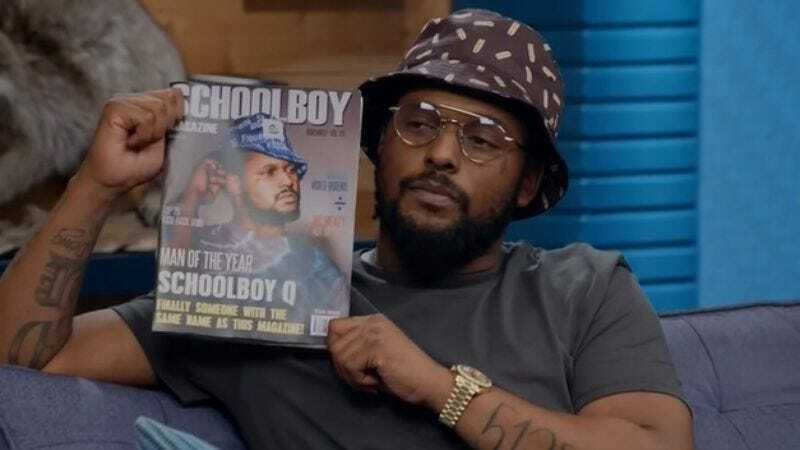 Rapper Schoolboy Q is an out-of-left-field choice for a guest, but “out-of-left-field” really just describes Comedy Bang! Bang! and its particular brand of comedy. Being a comedian isn’t a prerequisite for having a good episode of Comedy Bang! Bang! (“Wayne Coyne Wears A Halloween Costume” was one of the best episodes of season three, after all), but it does make it an uphill battle if the guest isn’t from that world. 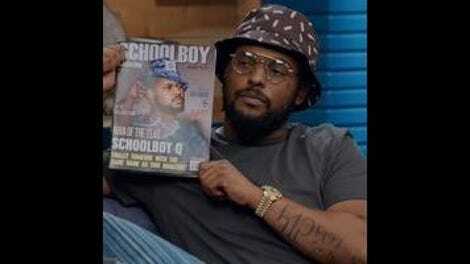 In the case of Schoolboy Q, the problem is the fact that the rapper is very much on the cusp of being a great guest throughout most of the episode, but his laid-back nature actually works to his and the episode’s detriment. “Schoolboy Q Wears a Patterned Bucket Hat and Glasses” is a great example of how dangerous a show can be when it’s largely improvised; it can be too loose and, as a result, rough around the edges. It would be one thing if Comedy Bang! Bang! were a new show that hasn’t proven itself yet, but at this point in the series, the episode’s roughness makes it an outlier. Comedy Bang! Bang! is a show that succeeds partially because of how slick and smooth the presentation is, and unfortunately, the combination of guests (for the talk show portion) and the upsettingly present green screen in this episode brings that all down. It feels like an amateur production from these professionals and not in an ironic humor way. Comparing the episode to jazz doesn’t make the roughness go down better. Also, I’m not the type of person who regularly slams a comedian for breaking during a bit, but in this instance, Horatio Sanz loses his composure so much that he can’t even maintain the Aaron Neville voice or character. Unlike Maya and Scott’s reaction to Maria Bamford’s Claire Coulter character in the previous episode, it’s difficult to stay invested or interested in the character or anything he’s saying. Scott tries his best to keep the energy up, but there’s nothing he can do about it, and it doesn’t look like anyone involved really cares. It’s obvious watching this episode that the majority of the effort put into making it came in the form of the X-Men/Ecks’ Men setup, and for that, everything else really falls to the way side. Again, there are no out-of-studio bits or fake trailers, so if the audience isn’t connecting with the talk show guests, there’s really no escape from that until the moments when Ecks’ Men material is brought up again. The blatant X-Men riff feels like something everyone involved had an insane amount of fun making, but it also falls victim to some of the sloppiness of the episode; the veiled “normal people” descriptor is quick to become “human,” long before Comedy Bang! Bang! just says “screw it” and Reggie’s adamantium claws come out to play. Still, this entire plot is the highlight of the episode, with the thinly veiled X-Men proxy characters leading to more and more light-hearted groans. Musicians as mutants make a lot of sense, especially when it comes to nü-metal (Reggie’s song with The Brotherhood, “Where the nookies at? / I did it all for a cookie,” is pretty amazing), and the whole plot succeeds in becoming progressively more ridiculous within the context of the show (but not within the Marvel universe). Reggie massacring musicians with his Wolverine claws just feels right, as does Ecks walking out of the wheelchair. (Sadly, the post-credits scene is more miss than hit.) The sloppiness of all of this works in a bizarre way that the sloppiness of everything else in the episode just doesn’t. Apologies from all of us in the CBB Trio for the delay on this review. Life happens, you know? You know. It’s community colleges battling because of Jim Rash’s presence, right? Right. I don’t mention it in the review, but Chris Parnell is absolutely fantastic as the Magneto of the piece, Melodio. The more I think about it, the more I find the Flea member of The Brotherhood (clearly a riff on Flea from The Red Hot Chili Peppers) to be the type of joke you’d find in a Seltzer and Friedberg movie. In fact, the Ecks’ Men plot is dangerously close to crossing that line.